Fantastic. A Ferrari of motorcycles. I don’t know how to best describe this bike. Except that it is really a great bike. My bias on motorcycles is that I like bikes that offer upright riding positions. And I like motorcycles that have an enduro or adventure appearance. This Ducati offers that. However, it has a super bike soul. It offers an incredible experience. I test rode it with a friend of mine who mentioned his arms wanted to be dislocated from the sockets under acceleration. Yes, this happens because you are riding a powerful motorcycle sitting in an upright position. This bike has four pre-set fueling maps (urban, enduro, touring and sport) that are actuated by a button. A rider can change the performance of this bike on the fly! The urban and enduro mode offer more gradual acceleration and a maximum power output of 100hp. 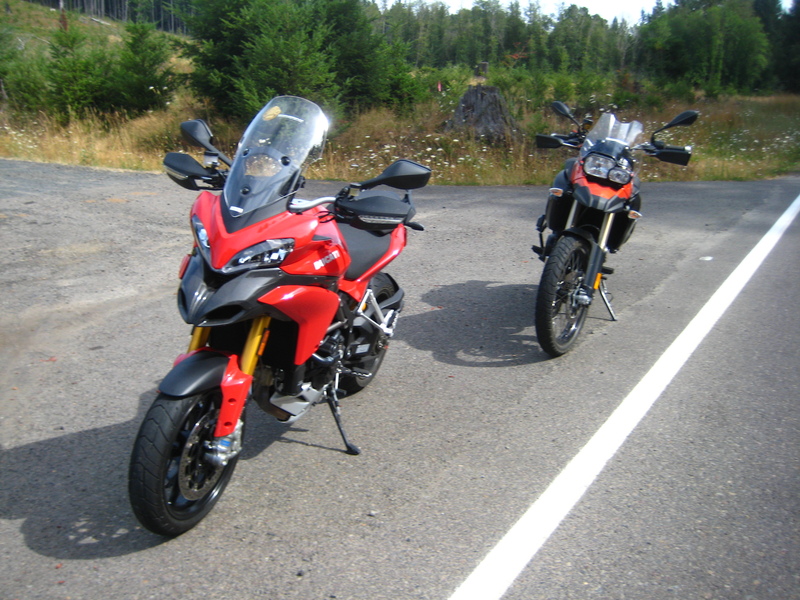 The touring and sport mode differ from each other in terms of how gradually the bike accelerates, and they both will take you to the maximum power the bike delivers (specs indicate 150hp). These four modes also manage different levels of traction control and ABS functions. 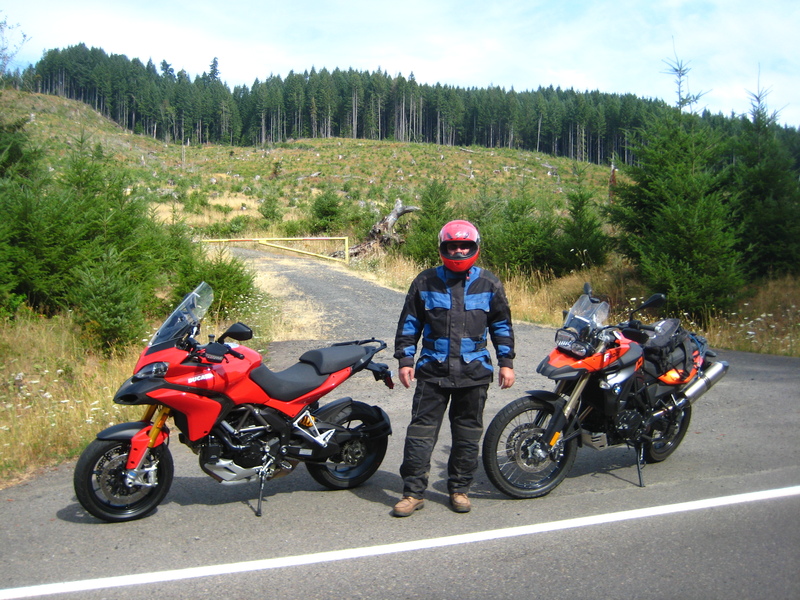 I tested this bike together with an F800GS. Riding them back to back helped understand a few of the characteristics of each one. The Ducati carves the curves with ease, accelerates as faster is better, and feels planted but light at all times and all speeds. The Ducati is really meant to be ridden fast. There is no cruising aptitude in its soul. The engine won’t sound “round” until you hit regions to the north of a 4,000 RPM level. But once it gets there, my friends, it sings! While the BMW F800GS could be ridden in 6th gear at any speed about 50mph and accelerate well out of it, the Ducati requires a more careful gearing management to keep the engine on its sweet spot. Nothing wrong with that – I like the idea of working through the gears. The problem? Yes, everything has a down side. Problem number 1 is that this bike wants to be ridden fast. When you least expect, you are effortlessly riding at 80mph. Or 100mph. Or… Problem number 2 is that when the engine is not on its sweet spot, it really surges and sounds as it is not happy. Like a race engine would sound. I hear Ducati has re-designed its fueling map and it is offering this upgrade to all 2010 models. I guess I will have to try it again when this has been consolidated. Would I buy it? Yes. But only if the revised fuel program will really allow the engine to operate smoothly at lower RPMs. Or if I become a true hooligan.